So, you’re a HumorQ champion. To what do you credit such an impressive sense of humor? Do you have some sort of ritual that you do that helps you submit champion caliber captions? Are there certain people you’d like to approach and say “Remember that day you said I wasn’t funny? 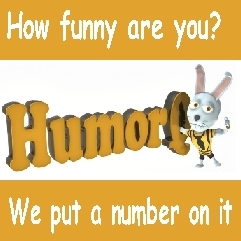 Well my humorq is (fill in your humorq here)” ? Well, let’s just say that my wife’s cat will never hear the end of this. Let’s say you realized a tiny goat family has been living in the glove compartment of your car, what would you say to them? There’s much more space in the trunk. Fair is fair. Do you have a question for me? When you sell your site to AOL / Huffington Post for a billion dollars, can all contributors sue you for unfair labor practices, or just us past champions? I'm hoping you all sue me. I will insist your cases be heard in HumorQ order for which AOL / Huff post will agree to restore my pre-litigation fortune. As Yukon Cornelius said many times "We'll all be rich!!!" . Finally, is there anything else you would like to share with the people learning about HumorQ? Once you learn the HumorQ champions’ secret handshake and see the clubhouse, you will realize that it’s worth the effort. Highly developed passive/aggressive tendencies and a desperate need for the adoration of others. Absolutely. I stare at the panel until something comes to mind. Christian Bogle does a great job setting the scene for quirky ideas. You’re not only a HumorQ player, you’re a HumorQ cartoon artist too. Can we hope to see more of that from you? As long as I can find the time between all the interviews that are flooding in. Eat all the tickets you can stomach. Is there any way you can talk more about me? Actually, the goats from your glove compartment and I have spoke at great length. They’re all like “She should pay those tickets. It’s her civic duty.”, and I’m all like “She’s a HumorQ champ. There should be recognition for that.” And then there’s this one goat that has paper in his teeth that says “I’m with Bob!.”. It’s really never ending. Is there another website (besides HumorQ.com where we put a number on how funny people are), that you would like the world to know about? Great site for exercising your grey matter and staving off Alzheimer's.